7.3.2018 Today’s excursion to the periphery of Madrid brought on a flood of images and sounds. The aim was to visit Parque Capriche while obstinately ignoring the note „closed today“ on my phone. 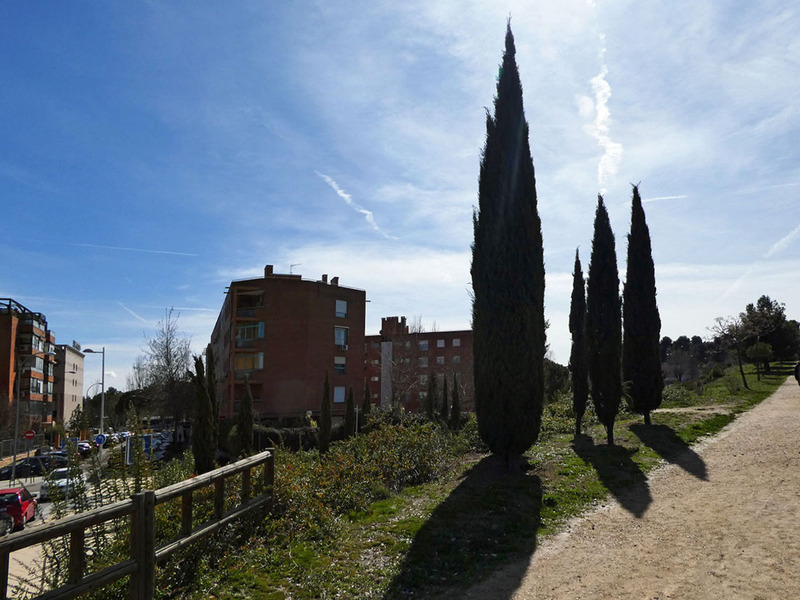 Leaving the metro at Capriche (instead of the advised station of Cnajallmos) I directed my steps to the close-by grove of cypresses, gravel paths leading past unkempt lawns when I eyes caught sight of a typical enclosure with a vertraut sign reading: Huerto Allameda de Osuna. 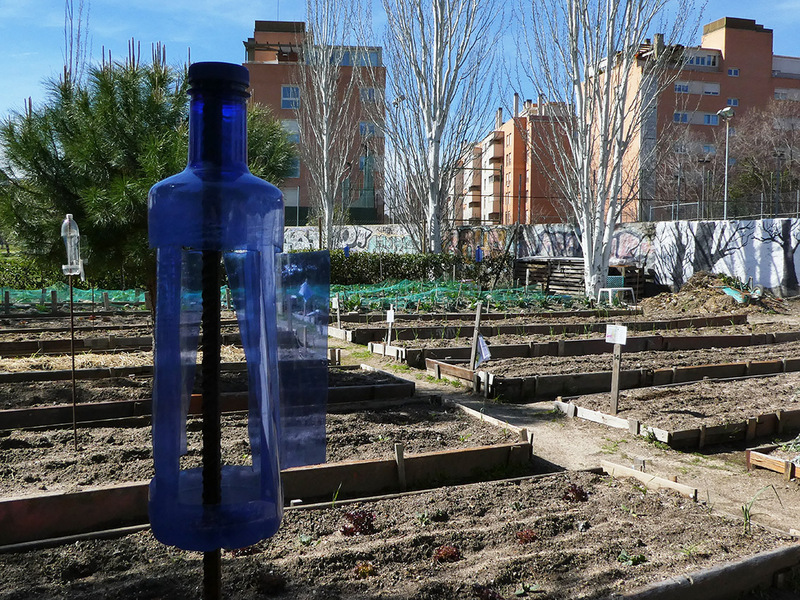 After leaving the huerto I continued in vague direction of the Parque Capriche sign. Julia and Floren also had asserted that this garden wouldn’t open its doors before Saturday. The area was already park-like: strewn with cypresses, trees with an abundance of cream-coloured berries (Medlar? Mulberry? ), dog walkers, blue sky, sun. To my right a wall covered in graffitis. To my left beige brick apparent houses loomed next to more beige brick apparent houses. Council houses? Condos (Hardly)? 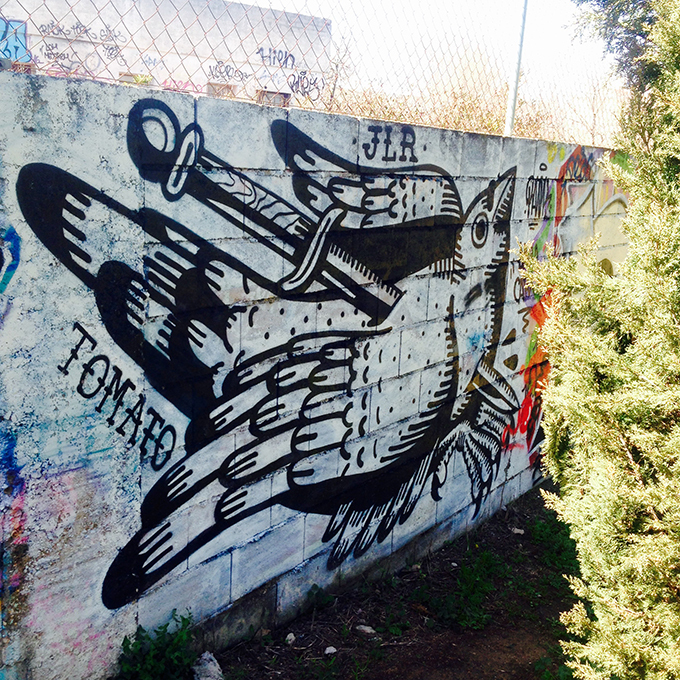 I followed the winding display of murals in the shadow of the wall. Used paper towels, plastic bottles, packagings, decorated the lawn: urban nature par excellence. On my phone, the blue spot indicating my position kept on hovering in the pathless green, creating the surreal feeling of somehow having been shrunk to half my size with distances doubled… Maybe this was because I felt the need to visit an aseo. More images of the wonder wall on Facebook. 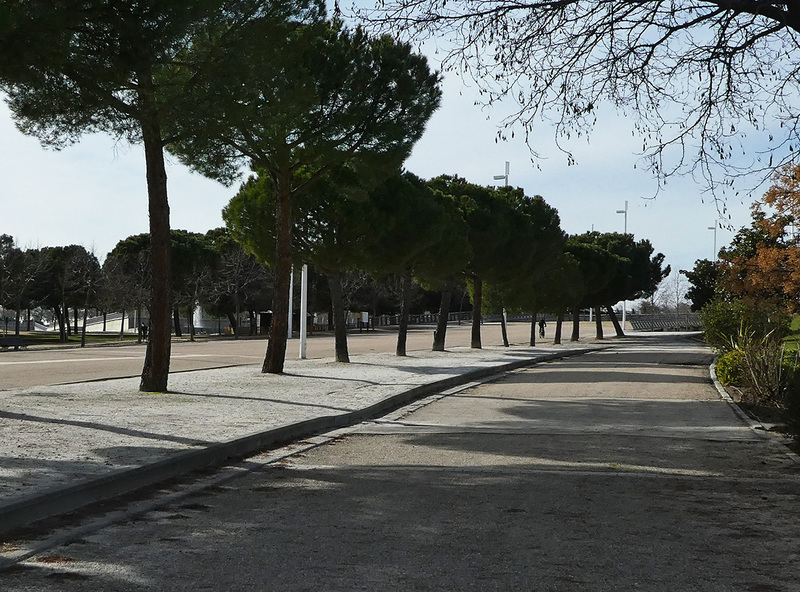 The closed gate of the Parque Capriche did not offer more to see than an impressive stretch of gravel leading up to an entrance building flanked by – no surprise – platanes. The murals had ended at a motorway crossing. There was an aqueduct in sight with trains running on it. On the other side of the street a spotless white wall opened up into a patio, and a friendly restaurant sign declared this to be the „Camping Osuna“. Una tortilla, una cerveza, un cafe, muy bien! Parque Juan Carlos: Thank you for not being neoclassical!!! Thank you for offering a place in space under a sky that sheds its blue-and-golden light onto industrial beauties, utilitarian architectures, the most aesthetically designed Staudamm I have ever seen, Mexican monuments, olive and juniper groves, futuristic playgrounds, grand alleys with – surprise! – not absolutely symmetrically arranged shrubs/trees. Thank you for emptiness! Best of all: The Grey Maze! Undoubtedly the home of countless happy rabbits (I saw only two -huge!- ones, but it was afternoon not evening). Parrots cut through the air, screeching, but still in a civilized manner compared to their relatives in Australia. Tiny birds twitter on twigs. Youngsters practice Kajak polo, a sport I never heard of before. 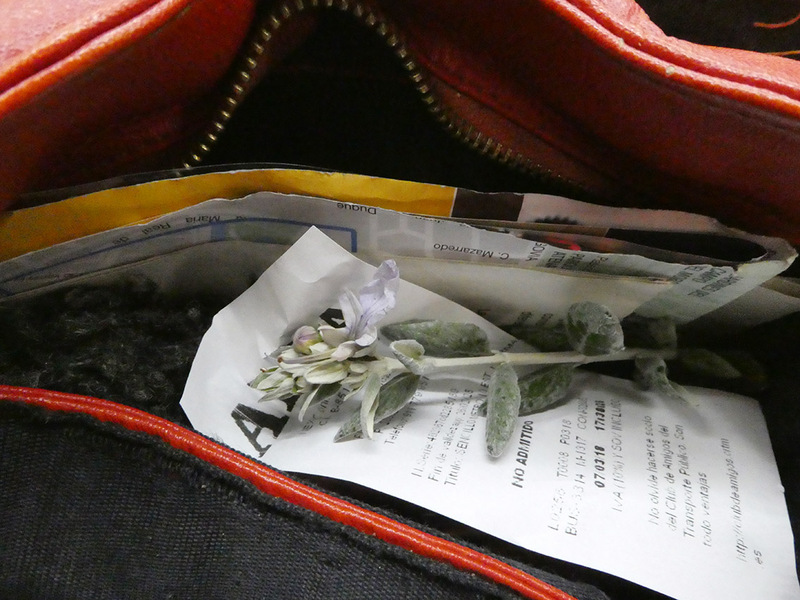 A twig of the maze hedges – unknown plant to me – wandered into my bag for further identifucation.